Free Westcoat Fast Stain Catalog: Fast Stain is a deep penetrating Concrete dye for interior concrete. 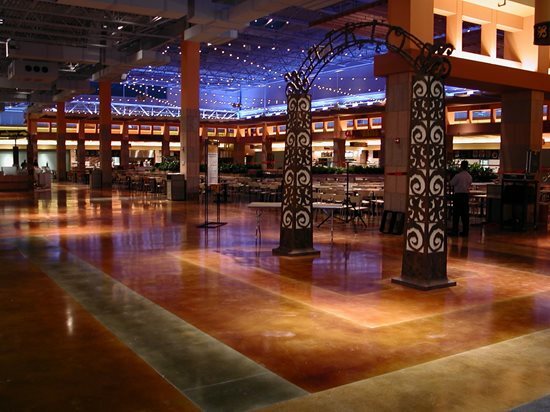 Dyes can get the applicator into more vibrant colors such as yellow, blue, and purple to name a few," says Bob Harris, president of The Decorative Concrete Institute and author of Bob Harris Guide to Stained Concrete Interior Floors. The nice thing about working with dyes is that you can mix them at the jobsite to obtain your desired color. Dyes are often used in conjunction with acid stains to produce a variegated look and, in most cases, complement the already stained floor. Dana Boyer, owner of Concretizen, uses concrete dyes as a normal part of her concrete flooring projects. Gary Jones of Colormaker Floors Ltd. agrees about the versatility of dyes. His company offers a proprietary line of water- and solvent-based dyes in a vast array of colors, including subtle earth tones, vibrant hues, and pastels. "We use a lot of dyes, which for us go hand-in-hand with the patina stains," he says. "The dyes back up the stain and give you a wider range and vibrancy of color. They also allow you to do more layering of color." Another proponent of dyes is artist Dana Boyer, owner of ConcretiZen. She makes her own dyes to enhance and customize her stained concrete work. "Applying a dye is like putting blush on your cheeks, over a foundation. It bumps up the color a notch," she says. Boyer notes that acid stains generally come in only about eight or so neutral colors. "With dyes, almost any color is achievable. It's an enhancement for the stain," she says. "You start with a base of color and build up from there." Les Davis, developer of BRICKFORM'S Dye-N-Seal had this important comment about concrete dyes: Translucent dyes penetrate the concrete drying in less than one minute in most climates with minimal cleaning required following the application. Therefore, the applicator completes the job about 60% faster than a typical acid stain due to reduced dry time and less cleaning. If you protect the surface with a topical sealer and/or wax you get a very vestal floor. Most water-based, solvent-based, or urethane-based sealers are compatible with dyes. In conclusion, dye is a powerful solution in virtually any application when the installer is seeking rich mottling effects with minimal installation time.